Washington State's oldest and most comprehensive guidebook for sport-fishing and boating fully revised, updated, enlarged. A county-by-county, lake-by-lake, stream-by-stream directory of 2,500 Washington freshwater and saltwater fishing and boating adventures. Now in its 9th Revised Edition, this encyclopedic guidebook is the bible for Washington anglers and has been since publication of the First Edition nearly 4 decades ago. If you have an older edition you know how valuable this book is, and because Washington’s sport fishing scene is rapidly diversifying, shifting and changing focus you know it’s important to update and keep pace with the latest changes. The 9th edition of the Washington State Fishing Guide, written and published by Terry W. Sheely, is enlarged to a catalog-size 8½ x 11 inch format, expanded to 416 pages, and enhanced with more than 50 maps revealing lake-bottom contours and river courses with access roads. The backbone of the statewide guide is the updated county-by-county fishing directory from Adams to Yakima counties with alphabetized fresh and salt water fishing waters, reporting the species of game fish available, state stocking levels, fishable acreage, a description of the water and surroundings, seasons, top fishing periods, driving directions, campgrounds, resorts and other accommodations. Identifies and details more than 2,500 fishing spots and includes the latest stocking information on triploid trout, tiger musky and tiger trout. A special saltwater segment identifies the top spots and tactics for fishing in Puget Sound, Hood Canal, San Juan Islands, Strait of Juan de Fuca, Pacific Ocean and Coastal Bays. Features include top spots for family fishing with kids, teaching kids to fish, summer and winter steelhead where-to, how-to salmon in saltwater and rivers, directions to saltwater piers and artificial reefs, trout fishing, bass, panfish, channel catfish, shad, sturgeon, albacore tuna, ocean sport fishing, preserving bait eggs, ice fishing, seep lakes, cutthroat, kokanee, sockeye, chinook, coho and chum salmon. High mountain lakes are included, with road access, hike-in trail systems, elevations and trout species plus the lakes and streams inside Olympic, North Cascade and Mount Rainier National Parks. The quick-reference format is easy to read and use. Fishing spots are treated as separate entries. Each entry is listed by county and in alphabetical order. A cross-reference index and appendix of the Lakes of Washington takes the work out of tracking down a rumored hot spot. The ninth edition of this statewide directory is written for anglers of all disciplines and experience levels as a comprehensive where-to, how-to revision of a book that for more than 40 years has been the venerable fishing bible for Washington. This is the most comprehensive where-to, how-to book available for Washington anglers. 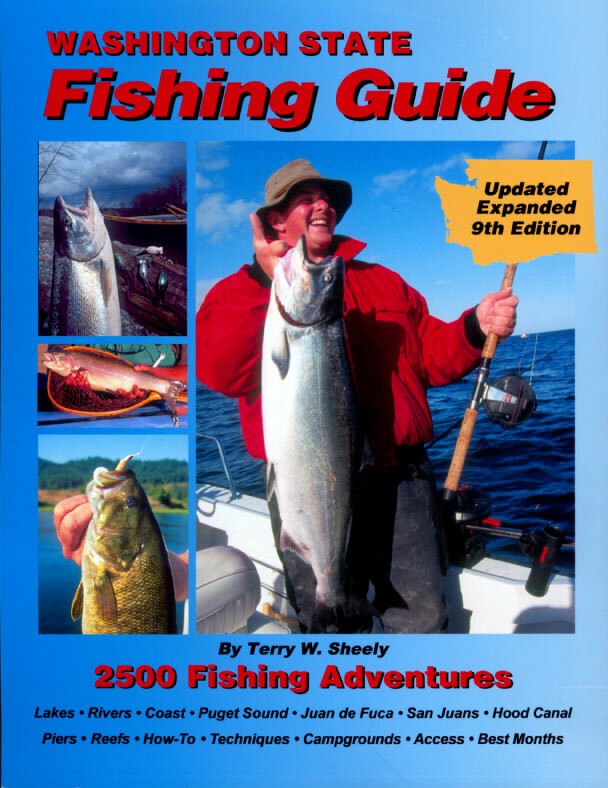 If you fish in Washington, this book will become your best friend. "At last, someone has put in the work to compile an up-to-date fishing guide to all of Washington waters. Sheely gets things right." "Can best be described as the Bible of Washington anglers." "This book has been, and continues to be, the fishing bible for Washington's 1.3 million licensed anglers. The list of subjects is almost endless." "Each of the (2500) hot spots is described in detail." "Regardless of your level of fishing experience, The Washington State Fishing Guide will make you a better angler and offer you more opportunities. This is the only one to have. It's right on!" "A great starting point for anglers curious about trying a new fishing spot."